The magnificent Oleg Volk is running a series of pictures at his blog encouraging the teaching of shooting skills, from one friend to another, especially among women. Now a crime in Washington. 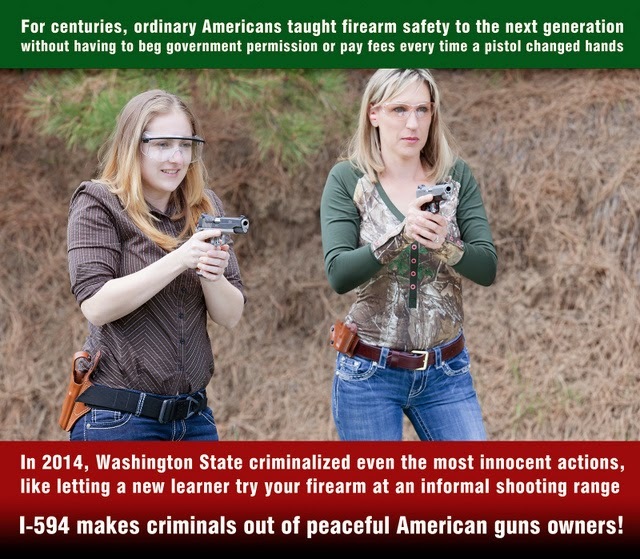 I told Oleg that he should make a version of this particular picture, the one with the gal teaching her friend to shoot, with a different caption: “This is now a crime in Washington State.” Since the I-594 initiative became law, handing the gun to your friend is an illegal transfer. Her handing it back to you is another illegal transfer. Oh, and if you left the gun at your friend's house? Felony. Criminalizing the touching of guns one doesn't own is the #1 way the Bloomberg ghouls can destroy the right to keep and bear arms in America, and they know it. They are already pushing this in Nevada, and are preparing to do the same in Maine and Arizona. They’ll push this poison state by state as far as they can. Once it becomes too “difficult” for the average non-wealthy person to own a gun, or learn anything about them except at a state-sanctioned facility ($$$$), most people won’t bother. Then, most people will be ignorant of guns, and of course the ignorant will vote against the rights of those of us who do. The Bloomghouls are counting on this to break the gun culture. "Who's going to prosecute such a crime?" you may ask. Perhaps nobody, but that doesn't matter. "It's essentially an unenforceable law!" you may say. It is, but that does not matter. You see, the modern Euro-American super-state (at the national, "state" and local levels) has so warped the minds of "middle class," threatening them with threat of financial ruin, incarceration, and legal harassment, to where most of them obey laws as a matter of course, no matter how ridiculous and freedom-sapping. People obey all manner of silly laws just to hold the mantle of "law abiding", and they will obey the laws against touching guns, too. Some of us will disobey this malum prohibitum nonsense, and the rest will cheer when we are jailed for "breaking the law". And there is a vast underclass who will never obey these laws, but will never be prosecuted for it because that would be "racist." So share your shooting and hunting skills with those around you, while you still can. UPDATE! Oleg Volk did a picture regarding the Washington the I-594 "no touching guns" law. Oleg rocks.